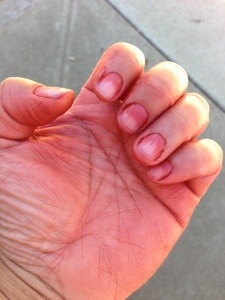 I spent a fun day digging and preparing a madder dye vat that left me red handed. Yeah, I didn’t think about gloves. We decided to be very methodical about this, instead of my usual slash dash way, in order to achieve a good clear red. We set about to peel the roots before chopping it up for the dye bath. 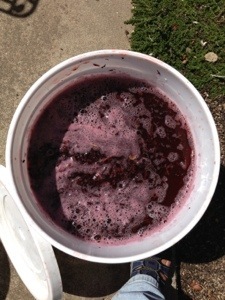 The bucket you see below is our wash bucket with root scrapings. I took the bucket home to play with it and see what colors I can get out of it. Dregs, if you will. P.S. We found that fresh madder roots are easy to peel. You peel it as you would peel ginger with a spoon. You end with just the skin taken off with little to no waste. That is, if you don’t count the skin, which has a lot of dye material too. Word is that the skin contains more of the yellows and browns, which I didn’t want.